After 7 day ride with the experienced team of Vietnam Motorbike Tour Expert, you will have unforgettable experience of the hidden beauty of Vietnam. This motorbike ride northern Vietnam also offers some famous attractions in North west of Vietnam including Sapa with amazing view of mountains or beautiful Thac Ba lake ….this is one of the most recommended motorbike tours North Vietnam that surely make you fall in love with Vietnam. 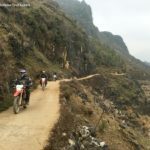 Day 1: Hanoi – Mai Chau: 180km. This Hanoi motorbike tour to Mai Chau will be started from outskirts of Hanoi at around 8 . Avoiding the busy traffic by taking some narrow and small country road. We ride our motorcycles west to Mai Chau, an area of beautiful landscape and home to the Thai ethnic minority. After lunch, we will motorcycle on forgotten French road No 6, passing extensive farming lands comprising a sea of paddy fields split by tree-lined roads punctuated by limestone karst scenery. Here is known as Ha long bay on mountain .We’ll motorbike up on Thung Khe pass, one of the most beautiful mountain passes in North Vietnam then descent to the beautiful valley of Mai Chau ( Home to the white Thai people who are living in houses on stilts). finish the first day and also the highlight of the 7 day motorbike tour in northern Vietnam in Poom-coong village – Mai Chau at around 5 PM. Day 2: Mai Chau – Phu Yen: 150 km. The motorcycle tour to Phu Yen is quite easy, we will have a lot of stops for pictures of amazing mountain view. We can start the day with a easy walk around the village or be lazy with a waking up café . After saying goodbye to the Thai people we ride up to the direction of Moc Chau. Lunch is after the beautiful Hua Tat pass and then after lunch, turn to the less travelled Road 43 that leads to the Da River. After crossing the reservoir of Da river at Van Yen ferry, we ride on a beautiful winding secondary road until Phu Yen where we stay overnight. Day 3: Phu Yen – Than Uyen – 210km. We should start the ride earlier today because this north Vietnam motorbike tour to Than Uyen offers a lot of picturesque stops so the ride starts at 8.AM. Right after the town we will be on the winding and beautiful Lung Lo pass and then hit the quiet road to Tu Le – a charming little town where we have lunch. The second half of the day is the highlight of the day. After 50km from where we have lunch, will be in Mu Cang Chai in which we have great chance to take pictures of the most beautiful terrace fields in northern Vietnam. Arrive Than Uyen at about 5.PM. 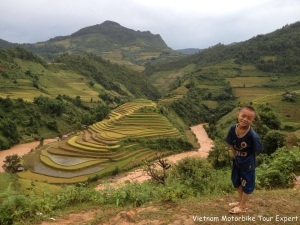 This motorcycle ride to Sa Pa is another highlight of the North Vietnam motorbike tour. The first half of the day, we will enjoy an easy motorbike ride on the smooth road with beautiful tea fields and the colorful hill tribes along the way. And the other half, we ride on Qui Ho pass to cross Hoang Lien mountain range- the highest one in Vietnam including Fanxipan peak with the height of 3142 meters above sea level. It’s sure that you will have pictures of the most beautiful valley in north Vietnam. We will be at Sa Pa at noon. After luch in Sa Pa town, we have half day to discover lovely town in cloud – Sa Pa. 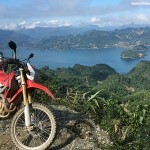 This motorcycle ride from Sapa to Luc Yen is quite easy and enjoyable. We can start the day at 9Am, hit the 40 km road down to Lao Cai where we can see China from Vietnam, and then keep riding on the beautiful and quiet big road No 70. And then make a turn to small country road to Luc Yen – a nice village of the Tay people who live in stilted-houses between green palm trees. Diner and stay with the Tay- Home stay. The road from Luc Yen to Vu Linh is quite flat. The short motorbike ride today should be the most enjoyable, after saying good bye to the family, we will ride slowly on the small country road with the green mountain and rice paddy fields on two sides. We can stop somewhere to visit several nice villages of the Dzao and Tay on the way. Lunch should be in Vu Linh – the village located on the bank of Thac Ba lake and then after lunch we have chance to see the biggest man-made lake in Vietnam. We are sure the lake will make you feel worthy to be there! Diner and stay with the Dzao people – Home stay. Day 7: Vu Linh Motorcycle to Hanoi – 170 Km. Vietnam Motorbike Tour Expert will do the best to avoid the main busy road for as long as possible . we will ride longer to get to road No2B which there is less traffics on. Then hit the road down to Red River Delta. A mixture of both challenging track and glorious sealed road all the way back to Hanoi. Be at Hanoi before rush hours and end the best motorbike tour in north Vietnam safely! It sounds like an wonderful trip. I did a motorbike tour on Ho Chi Minh trail Vietnam before and wanna do another tour in Northern Vietnam and this 7 day ride is a great suggestion for my next adventure motorcycle trip!! !